A variety of refreshing summer melon mingles beautifully with crispy arugula and kale, punctuated with feta, farro, cucumber, mint and pepitas. Splash on our spicy citrus dressing, sit back and crunch away. 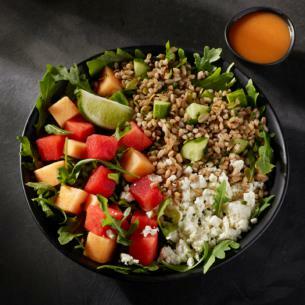 watermelon, cantaloupe, kale, arugula, spicy citrus dressing (water, canola oil, olive pomace oil, honey, lime juice concentrate, salt, distilled vinegar, dried shallots, dried chipotle pepper, lemon juice concentrate, lime oil, xanthan gum), water, cucumber, farro (wheat), feta cheese (pasteurized milk, salt, cheese culture, enzymes), lime, pepitas (pepitas, cottonseed and/or canola oil, salt), canola oil, parsley, salt, sesame seeds, olive oil, peppermint.